To kick off our crafty kids money activities, it’s the classic Lemonade Stand! Set up a mini-shop outside your home and encourage the kids to sell cups of lemonade. You’ll just need a table, some signs, paper cups and a fair bit of elbow grease to squeeze all of those lemons. You’ll need some sparkling water, sugar, ice and a whole lot of lemons. Squeeze the lemons in a jug, add some sugar (we recommend about 1 tblsp for every 4 lemons), sparkling water and ice. You could add a touch of class with some sliced lemons. Once you’ve got your product, you’ll need your stall. A pasting table works well. Add some signs to tell your customers what’s for sale, and how much it is. Then make a float. Add a variety of coins to a cash register (Tupperware container, bum bag, canvas sack) so it’s easy to give change to the first few customers. Encourage the kids to write down how much the ingredients and materials cost, and how much money you added to your float. They’ll want to subtract these costs when you’re working out how much profit they’ve made. The great thing about the lemonade stand is that it covers almost all the basics of money management. Spending (to buy the lemons), budgeting (to work out the sale price), earning (as they’re providing a service), saving (if that’s what they decide to do with their takings), and some good old fashioned mathematics, as they work out their profits at the end of the day. You can’t beat it. Unless it rains, of course. It’s a great exercise for children to explore the difference between needs and wants, especially when it comes to parent’s money. Do you need the latest video game? Do you want to have dinner tonight? We’ve made an easy PDF that you can print out and the kids can have a go at compiling a list. Why did you decide to put each item into a particular category? Can they justify all of their choices? Needs and wants. Decision making. Understanding the difference between needs and wants is key to good decision making in all aspects of life, not just money. We could all do with a refresher on these concepts – even as adults – so the earlier children can start to think about the differences, the more prepared they’ll be to make smart money decisions later in life. Saving money is essentially working towards a goal, and focussing on that goal (whether big or small) can make it easier to achieve. The same goes for us adults. We don’t just save; we save for a holiday, for retirement, to pay off our terrifying student loans, a new house etc. 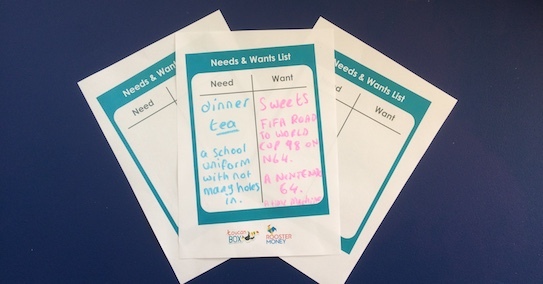 Reward charts are a great way to develop those good savings habits (they can also help with good behaviour, too! ), and you can easily adapt one to include costings at each reward stage. Design a reward chart together, or download RoosterMoney’s customisable free reward chart. Discuss what your child wants the reward to be. Agree on the behaviour or actions that will earn contributions towards the reward, and then calculate what each stage of the reward will cost. Your chart could look like ‘stepping stones’ towards the main prize. Stickers are a simple way to show the completion of each stage. Whether your design is on an A4 piece of paper or huge and multicoloured, just make sure it’s up on display, so everyone can see the progress towards the goal. Reward charts are a great visual way to encourage your child to work towards a goal, and helps instil the idea of delayed gratification. It’s also a useful way to build good savings habits without making it purely money related, if you feel your child is too young for that. If you fancy mixing it up, try having a conversion system too; instead of just working towards one goal, two stars equals a magazine, three stars equals a play date, and so on. This will help introduce some good decision making skills. 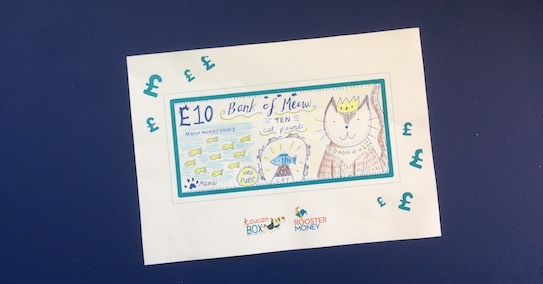 This is one of our favourite crafty kids money activities. The £5 and £10 have been redesigned and released by the Royal Mint. While we wait for the grand unveiling of the £20 note in 2020, encourage your children to design their own one. Who will they add to the note? What other important information needs to be on there? Perfect for children of any age. We’ve created a free colouring sheet you can download and print out at home. Origins of money. Value of money. Foreign currency. This is a great hands-on exercise to provoke the conversation about what money is and what it’s worth. Point out the words ‘I promise to pay the bearer on demand the sum of £20’ and explain that’s because the paper money used to represent bars of gold that you could get from the Bank of England. Nowadays that’s not the case of course, but it’s a good way to start talking about how money began, with bartering of different items. You could even start designing your own 20 Euro and 20 Dollar notes as well to open the conversation about different currencies. And so to the last of our kids money activities. This one is a great way to bring together a lot of big money ideas in accessible ways. We’re taking the learning of the lemonade stand a little further; expanding on planning skills, running up total costs of items, and considering labour costs. This activity is great for older children. The challenge: the kids must host a family dinner party. Spending. Savings. Budgeting. Earning. Decision making. Just like the lemonade stand, this one touches on all areas of money management, but in a slightly more detailed way. Try setting the budget just under what they might need, so they have to make decisions on what to compromise on. It’s a great one to do with friends too, as there’s ample room for debate around certain topics like how much to mark up certain items, how much your time is worth, and of course, what you’ll do with your profits. 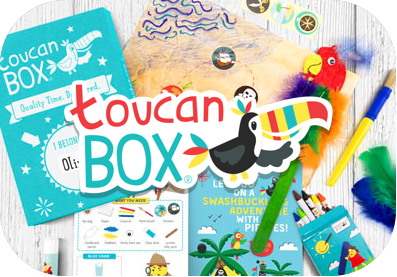 toucanBox is an award winning subscription service delivering activity kits to kids aged 3-8. Each box is built by educational experts to help develop key skills through hands-on play. All the materials, instructions and inspiration are included to make getting creative easy, stress-free and really good fun. Use code ROOSTERMONEY at www.toucanbox.com/taster for a free-trial.